Selectmen will discuss three potential plans for the Beach Road project that has been in the works for over a year. Tisbury selectmen will hold what could be the final discussion of the Beach Road renovation project when they meet at 5:30 pm in town hall. Last week, selectmen said members of the public would be given time to talk about the project before the board takes action. 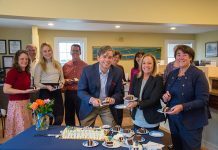 Following more than one year of discussion by selectmen, the planning board, Martha’s Vineyard Commission, Tisbury transportation subcommittee and the Massachusetts Department of Transportation (MassDOT), three plans for a comprehensive redesign of the road corridor from Five Corners to the drawbridge remain on the table. One plan is a “symmetrical” road, with two 10.5-foot travel lanes, 4.5-foot bicycle lanes, and 5.5-foot sidewalks on either side extending as far as the Lagoon Pond drawbridge, which requires bicyclists remain in the road. A second possibility is a “hybrid” design, which has the same design as the “symmetrical” plan from the Five Corners intersection to the Tisbury marketplace, with an eventual transition to a section with a 10-foot SUP that would connect to the existing SUP between Winds Up and the Lagoon Pond drawbridge and a future 10-foot SUP crossing over the bridge into Oak Bluffs. The asymmetrical hybrid design is an attempt to accommodate bicyclists both on- and off-road. A third “hybrid hybrid” plan surfaced on Sept. 22 at a meeting of the selectmen and strays from the initial “hybrid” design by continuing a sidewalk on the harbor side of the road to Packer’s wharf, where the cruise ships dock. That sidewalk extension would require a reduction on the south side of the road. The 10-foot SUP would be reduced to 9 feet, and the 4-foot buffer reduced to 1.5 feet. Last Thursday, the only element of the ongoing Beach Road project that seemed to be widely accepted was put into question at a meeting of the Tisbury vision council. Several speakers expressed an interest in returning to the 43-foot right-of-way initially proposed by the MassDOT. Planning board and vision council member Ben Robinson said the MassDOT came to the town with three possible options last July. Two were 43-foot rights-of-way, and one was a 46-foot right-of-way. He said at that time many members of the town, especially abutters, were not interested in the wider rights-of-way and wanted to keep the road as tight as possible. Over the course of the discussion the Tisbury transportation committee has gone back and forth with the MassDOT design team in an attempt to satisfy the initial effort by the Martha’s Vineyard Commission for the project to provide bicycle and pedestrian safety and provide a link between down-Island towns via a network of shared-use paths (SUP), off-road paths for bicyclists and pedestrians. Last Thursday, many speakers expressed dissatisfaction with the compromises made in an effort to stay within the 41-foot right- of-way. Several speakers brought up eminent domain as a means to complete the road with a 43-foot right-of-way. Duane Case pointed out that could be an expensive and drawn-out affair. Mr. Robinson said that it would be handled by the state. Mr. Robinson asked how many people were interested in the wider right-of-way. Almost everyone raised their hands. 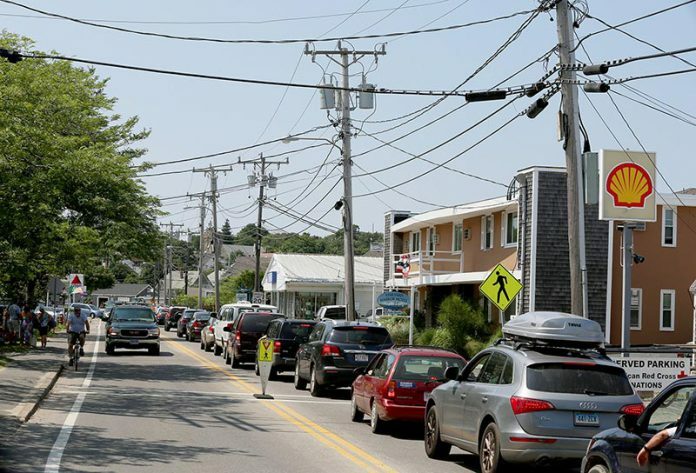 Bill Veno, senior planner for the Martha’s Vineyard Commission, pointed out no roads on the Island are wider than 40 feet, with the exception of the three lanes of traffic on Edgartown Road coming into the Look Street intersection. He questioned whether having two more feet would make a big difference. “Mass Highway has said that all of these options are safe,” he said. Mary Ellen Larsen, Tisbury finance committee member, pointed out the futility of discussing a 43-foot right-of-way at this point in the process. “I feel like tonight what I’m hearing has totally undone all the work and negotiations that have been done,” she said, adding that selectmen are voting between the hybrid, “hybrid hybrid,” and symmetrical road plans. Selectmen Melinda Loberg asked people to consider what they would like to see for a design if the 41-foot right-of-way is the only option, and attend the selectmen’s meeting on Tuesday. “I think the conversation tonight has been very useful and very interesting to me,” she said. Following the meeting, Ms. Loberg said that although there was a previous decision among town officials to utilize a 41-foot right-of-way, MassDOT is still open to other plans and widths. She said the goal remains to move forward with a plan that considers the safety of all modes of traffic. Friday, Mr. Robinson said it would have been nice to have meetings like Thursday’s earlier on in the Beach Road project process, but the council, recently established “to focus on the attainment of vision goals, coordinate community outreach, and develop collaborative partnerships that foster broad community involvement,” has only just begun. He said the hope is that the council will serve as a helpful venue as other projects come through the town. “It allows for a more free flowing discussion, something that is harder to do within the setting of official public meetings,” he said. In other business, the vision council discussed initiatives they hope to undertake. Goals include re-evaluating maintenance of Owen Park, strengthening other town parks and “turning them into real assets,” working in conjunction with the Department of Public Works to look at the condition of town buildings, and evaluating a survey done this summer on the condition of town sidewalks. “I think there’s some really exciting pieces,” planning board member and vision council coordinator Cheryl Doble said. The vision council meets next on Thursday, Oct. 8.